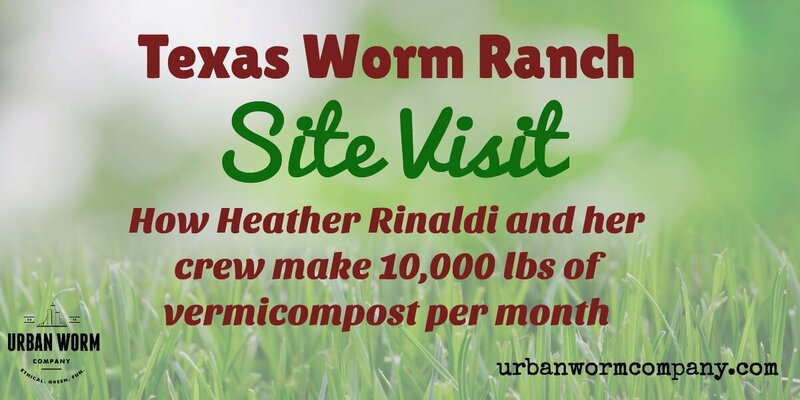 Earlier this year, I had the opportunity to interview Heather Rinaldi of the Texas Worm Ranch. As luck would have it, Heather and I hit it off over our e-mail exchanges and that interview turned out to be one of my most popular yet. Though vermicomposters tend to be very knowledgeable about what worm castings do for soil and plants, Heather has a next-level grasp on why the microbiology of vermicompost, especially her fungal-dominant variety, is so beneficial for plant growth, pathogen suppression, water retention, and soil remediation. My “day job” as an pilot for Southwest Airlines requires that I make an annual trip to Dallas each year to demonstrate that I’m no danger to the flying public. So I was more than pleased when Heather offered to give me a tour of the Texas Worm Ranch on my latest visit in August. As Heather took me through a tour of her facility, starting with the classroom, precomposting area, vermicomposting beds, and ending with the harvesting and tea brewing equipment, I figured it made sense to describe it in the same order. While on one hand I hate to recycle a subject like Heather’s business so soon after I interviewed her this spring, I felt a report of my visit to a thriving vermicomposting business was too good to pass up. Heather greeted me out front and showed me to her classroom where she conducts several classes per month about vermicomposting, gardening groups, and other sustainability topics. No great shakes in the classroom, no technical gadgetry, no fancy furniture. Just a whiteboard, projector, folding chairs, and on Saturday afternoons, Heather’s brain. Heather says learning by doing is the best teaching method, so classroom discussion is supplemented by hands-on action in organic gardens in front of the building and out in the worm warehouse. We walked through the warehouse where I met Kazuko, who was finishing her shift. Kazuko is a native Japanese lady who enriches the operation with her expertise in composting, fermenting, preservation, cooking and gardening. I also met Scott, a quiet guy who serves as Texas Worm Ranch’s operations manager. verage of 2 tons per week of leaf waste and wood chip waste. The piles of waste will pre-compost many months until Heather and her crew go digging for what they consider bed-ready material. There’s no forced air O2 pre-composter or Bobcat to turn the piles. In fact, Heather doesn’t see the need to turn them at all due to the active worm populations and the amount of time she allows for static composting. Her team also adds some coffee grounds, spent castings from worm tea brewing (that’s probably where worms in that pile came from) and many pumpkins they get post-Halloween to speed up the process. When it’s time to fill a bed, one of Heather’s crew heads out to one of the older piles with a pitchfork and simply finds compost on the interior of the pile that’s ready to go. As you may know, Heather has a bit of a unique setup. While most larger vermicomposters use continuous flow-through digesters, Heather has a simpler but more labor-intensive method of vermicomposting in 70 4ft by 8ft raised beds made from reclaimed lumber from a nearby apartment complex. Each bed is in a different state of maturity, which Heather tracks using an ingenious system of flags to signify if a bed is in need of watering or feeding, ready for harvest, should not be fed, etc. While most of the beds are full of yard waste, Heather also supplements with pre-consumer waste from a local juice bar, to include citrus which most home vermicomposters using closed systems will avoid. It is an open air system with the only protection being a layer of leaves so the beds won’t dry out. The heat release allowed by of this type of system also allows her to feed in larger quantities. Depending on the ambient conditions, each bed can take between 8-12 weeks* from start to finish before the Texas Worm Ranchers start the pre-sifting process. *Bins that finish in 8 weeks were started with already-processed material from other bins. Remember, this is after being outside in fairly active worm piles for months before being brought indoors. The lowest worm populations in the outdoor piles would occur in the late summer months, but after cooling down in October (and especially after they add pumpkins to the mix!) you would find reasonable amounts of worms until June or July. As the beds are filled with a woodier medium than “typical” manure-based vermicomposting systems, there is quite a bit of rougher material to sort before the vermicompost meets “Bertha,” the trommel-style castings separator. So Scott and his crew send the vermicompost down a half-pipe of 1/4-in landscape screen suspended inside a frame built from 2x4s. The frame is shaken quite vigorously by a powerful little motor that I was surprised to learn costs $450. But it does the trick and that’s all that matters. One the vermicompost has been pre-sifted, it meets its final processing inside Bertha which rotates atop a tarp that catches the fine castings and funnels them into two tubs that sit below. After final processing, the finely processed vermicast is stored in 25-gallon mineral tubs procured from a local grass-fed beef rancher until it’s bagged for sale in roughly 10-lb increments, though Heather often includes an extra pound or more for customer satisfaction. organic gardeners, grass-fed beef producers, and organic lawn care companies who pre-order their tea to ensure it’s ready when they need it. At the time of my visit, Heather had about 40 gallons brewing for the past 24 hours and my my math, it was due to brew another 40 hours or so before her Saturday class. Now here’s the really cool part. Heather and her team can brew their tea to fit whatever profile they – or their customers – need at the time. Want a more bacterial brew? They can do that. In the mood for something fungal? I was actually surprised at how simple of an operation the Texas Worm Ranch really was. The difference between Heather Rinaldi’s operation and that of a garage vermicomposter is scale, discipline and daily attention rather than complexity. This is not meant to be a putdown in any sense. The simplicity is intentional. And I want to stay on this point for a second. Though I’m no expert in any of the following fields, I enjoy pondering “systems,” whether it’s website creation, app programming, or or the everyday workspace. Though complexity is often lauded as an achievement, it introduces fragility to a system. The parts of a machine can be so interconnected that a single failure can bring the entire system down, whether it’s at my own employer or at a large scale vermicomposting operation (see the Charlotte Airport’s failed attempt to vermicompost post-consumer waste at CLT). The Texas Worm Ranch style of vermicomposting is not fragile. And it’s not fragile because it is simple. Short of a tornado (there’s none of those in Texas, right?) or a long-term power outage, there’s not much that could take the Texas Worm Ranch operation offline. There are no CFT breaker bars or winches to break. Because she has a system of multiple beds, a disease in one of her beds doesn’t spell doom for 50-100% of her worm population. Her feedstock isn’t some high-nitrogen labyrinth of post-consumer food waste that needs to be monitored for pathogens. It’s also not material she needs to actively collect. It’s a simple mix of leafy, woody compost supplemented by waste from a juice bar with seasonal treats of pumpkins. Between higher capital or labor costs, Heather, like John Purser of the Worm Farm in Durham, CA made the conscious choice to accept higher labor cost. In a low cost-of-living state like Texas, this may be more feasible than in most states. But it’s not like California is cheap to live in either so, draw your own conclusions there. Heather’s beds that are ready for harvest are not something I would have recognized as “finished” before this visit. Because her material is woody, it does not break down in a uniform fashion and will not look like a homogenous mass of black gold. And even when it’s finished, it looks more brown than black, reflecting the medium in which it was produced. The following from Heather regarding TWR’s vermicompost. Very important—good compost and good vermicompost should have a dark cocoa bar color (say 70% high dollar cocoa bar). Black compost is an indication of your compost having been in an anaerobic state at some point. I can smell an ammonia odor from compost that is in that state. You might have a higher number of ciliates (anaerobic indicators) in your Lab tests when you have this black color. That’s why diligence in feeding and moisture content of your bins is important—you don’t want to overdo it and turn your bins anaerobic. Our open, wooden bins allow more breathing than a metal or plastic bin and we are better able to avoid anaerobic conditions (extreme humidity can be an issue after lots of rain+heat). Our woody/leafy mix is also VERY different than animal manure-based vermicompost and we allow many weeks to pass with no additional juice bar mix being added before harvesting. I would never want to see (or smell) visible Nitrogen sources like manure or food waste in any “finished” vermicompost, but small amounts of carbon leaf matter or small wood matter will be a natural home for beneficial fungi inoculation. Our Lab tests reflect this and our large bulk customers are thrilled with the Lab tests they have run, as well. Heather says most home vermicomposters tend to wait too long to harvest, often many months, which means they’re stuck with anaerobic, spent vermicompost past its most useful microbial activity. Or at least it doesn’t have to be. But it does take diligence and discipline to maintain a consistent food source and a system to monitor and maintain the appropriate conditions. You can’t run a business by the seat of your pants, especially when employees depend on your guidance to do their work. Heather’s husband is an industrial engineer and has absorbed his lectures on maintaining quality control, efficient and replicable processes, and cycle time management, which Heather says is key to consistently producing enough to keep her customers satisfied. And I should mention that Heather’s customers are willing to pay a STEEP premium for her to ship to them. It’s that good. Many thanks to Heather and her team for hosting me, showing me around, and explaining the operation. And I can’t forget the introduction to some local craft beer as well! This was great fun and I’d highly recommend seeing a “real vermicomposting operation” in person. It’s invigorating, no doubt! To learn a little more, I recommend reading my interview with Heather Rinaldi about the Texas Worm Ranch. And to get a PDF of that interview, please sign up for my e-mail list and I’ll get you access today! After 20 + years and trials and errors the statement “Black compost is an indication of your compost having been in an anaerobic state at some point” is complete nonsense, ask some of those that have been working with worms and compost for decades!